Spray Polyurethane Foam (SPF) roofing provides excellent insulation and custom slope to avoid ponded water issues and improve water flow to drainage. SPF roofing systems require a roof coating to be applied over the foam in order to cover and protect the spray polyurethane foam from deteriorating due to the sun’s harmful UV rays. National Coatings’ offers several different types of spray foam coatings that have the ability to block and reflect essentially all of the sun’s damaging rays always from the roof top, protecting the SPF roofing system and building below. These coatings are ideal for a newly constructed SPF roof, as well as, a SPF roof that needs a re-coat or restoration in order to prolong its roof life and lower roof maintenance costs. Our spray foam coatings all contain low levels of VOC’s, provide energy cost savings and create minimal disruption to the tenants and occupants inside the building during construction. These coatings have been successfully used on spray foam roofing systems for over 30 years, providing renewable and sustainable systems that are seamless and have outstanding waterproofing capabilities. Our spray foam coatings range from topcoats, base costs, quickset coatings and specialty coatings. Our topcoats are highly reflective, providing longevity and brightness with superior dirt pick up resistance and protection against biological attach such as algae. These topcoats exceed all ASTM D6083 requirements, offering excellent tensile strength, elongation and wet adhesion. 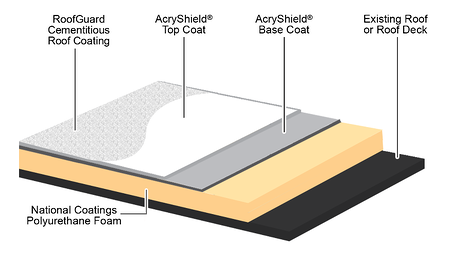 The AcryShield spray foam base coats are engineered to provide optimum and superior adhesion to SPF while adding additional waterproofing to your roofing system. Our quickset spray foam coatings come in base and top coats and are ideal for resisting early wash-off associated with heavy dew and light rain. We also have a range of specialty coatings that offer different advantages and protection to your spray foam roof including: low temperature flexibility, extra foot traffic and physical abuse protection, ultra high reflectance and coating for buildings and rooms where there is a reverse vapor drive (cold storage, food packing plants, etc…). Our spray foam roofing brochure can provide you with additional information on each product specifically and more details regarding our SPF roofing systems, warranty information and spray foam coating colors. Learn more about National Coatings and our offerings by download our SPF Roofing Brochure today, it’s FREE! AcryShield® SPF Roofing Systems are engineered to last the lifespan of your building; they do not degrade like other roofs. The profuse waterproofing from long lasting sprayed polyurethane foam (SPF) and high-performance acrylic elastomeric roof coatings also eliminates deterioration and damage caused by harmful UV rays. Tests prove that roof performance properties in year 15 are equivalent to the initial installation. Need big boosts in your R-value? Looking for a fully adhered membrane with superior durability and strength? Want a seamless, monolithic roofing system with excellent waterproofing capabilities? Having ponded water issues and looking for a roof with custom tapered slopes to eliminate ponded water indefinitely? All of our AcryShield SPF Roofing Systems offer these excellent benefits and more. Operational and building maintenance costs are increasing year after year primarily due to energy related expenses constantly rising. Building owners are frequently looking for ways to lower these costs without compromising their buildings safeguard and defense. With energy being the greatest controllable operating expenditure to a building owner, we suggest saving money while cooling and protecting your roof with the AcryShield Spray Polyurethane Foam (SPF) Roofing System. The quickest and best way to cut energy usage and related costs to your building when needing a new roof is to get an AcryShield SPF Roofing System. This system has excellent adhesion over existing Asphalt, BUR, Concrete, Metal or Wood membranes - eliminating the need for a costly roof replacement. The SPF system is spray applied, creating a seamless, custom-tailored waterproofing roofing system to meet your buildings specific needs. During application, your business operations are conducted as usual, avoiding any need for business closure. The AcryShield SPF Roofing System uses a durable roof coating; high in UV blocking pigments to give your roof the added protection it needs from the sun’s harmful and damaging UV rays. How do Spray Foam Roofing and Roof Coating Work Together to Save on Energy? The AcryShield SPF Roofing System uses topcoats with high solar reflectance, protecting the building by reflecting the sun’s heat away from the structure; therefore, reducing heat transfer into the building, keeping the inside cooler. These coatings also have high thermal emittance properties, which allows the small amount of absorbed heat that was not reflected immediately, to be radiated back into the atmosphere, again lowering the ability to transfer heat to the inside. While the solar reflectance and thermal emittance properties can greatly reduce the energy demands of cooling the building, these are just the benefits of using a National Coatings elastomeric roof coating. Let’s take a look at the benefits of spray foam. The spray foam roofing provides high performance insulation to the roof. This reduces the buildings ability to lose or gain heat, keeping a constant ideal temperature inside the building with less need to use the air conditioning or heating systems. Now that we know you can conserve energy with roof coatings and spray foam roofing separately, it is easy to determine that by combining the two, your building will conserve an even greater amount of energy. The AcryShield SPF Roofing System specifically can reduce your energy consumption and costs up to 30% per year. This is a huge reduction in cost based off California’s energy-efficiency movement - Flex Your Power© which states “A 30% reduction in energy consumption can lower operating costs by $25,000 a year for every 50,000 square feet of office space.” If you are interested in additional information on Spray Foam Roofing and the Benefits of Coating an SPF Roof, download our FREE Guide.